Mavis Staples On World Cafe : World Cafe Staples' gospel-rooted solo recordings have captivated artists such as Bob Dylan and Prince, and helped pave the way for contemporary soul music. Over the course of her 50-year career, Staples has become a legend on the strength of her huge vocals and messages of hope. 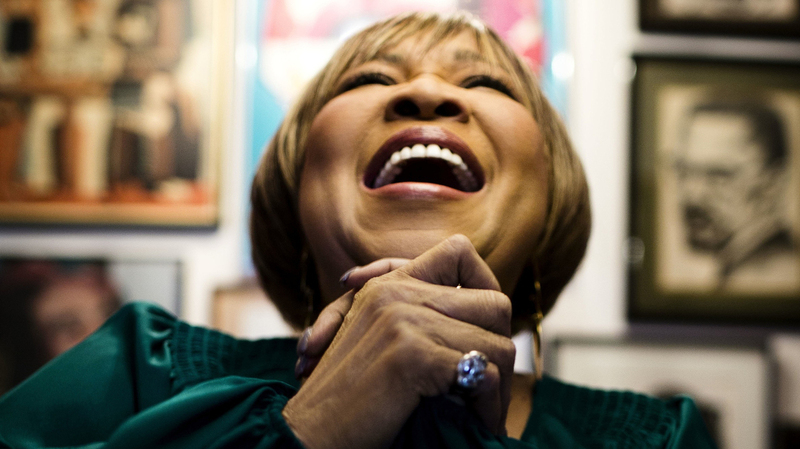 "Wrote A Song For Everyone"
Mavis Staples is our guest today in a Vintage Cafe segment from 2010 — around the time she released her album You Are Not Alone, produced by Wilco's Jeff Tweedy. Staples began singing with her brother and sisters, as well as their father Pops Staples, as part of The Staple Singers in the 1960s. The gospel group traveled the South frequently, often appearing with Dr. Martin Luther King Jr. at civil rights rallies, and released a string of fondly remembered crossover hits with Stax Records in the 1970s. Before You Are Not Alone, Staples recorded an album with Ry Cooder titled We'll Never Turn Back.